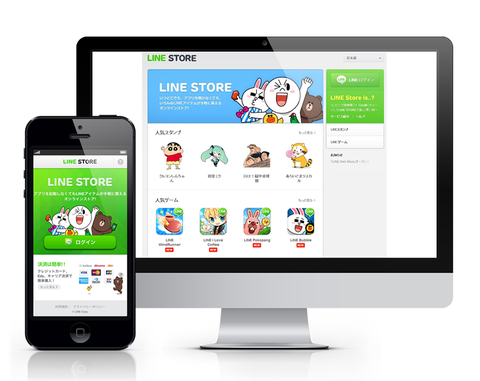 Mobile messaging service Line has expanded its monetization efforts after launching a Web-based store to allow users, and in particular those without credit cards, to buy stickers and other content for its service. The Line Web Store, store.line.me, is initially only available to users in Japan, but the company said in a blog post that it will launch worldwide — it is scheduled to open in Taiwan, the first overseas expansion, later this month. Like the mobile-based store, items for sale include Line stickers — see a full explanation of stickers here — as well as virtual currency for various Line games. However, where mobile stores support in-app payments reliant on carrier billing (in some markets) or credit cards, the Web store offers a wider range of payment support, including a range of Japanese services. Line has said in the past that PayPal will be among the services supported worldwide. The Web store is part of a wider retail push that Line is making to monetize its user base of 230 million registered users. As revealed at its annual event last month, the company is introducing prepaid cards at selected convenience stores to let customers buy content using cash. The move is particularly interesting since Facebook — which is being bested by Line, WeChat and other messaging apps in some parts of Asia — just shuttered its virtual currency system in favor of local currency denominations. Line’s move to be a content platform is bringing in revenue, although profit is less clear. It booked $132 million for Q2 2013, while it makes $10 million per month from the sale of stickers alone.